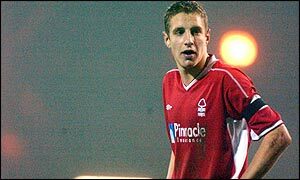 England Under-21 international Michael Dawson has agreed a new five-and-a-half year contract with Nottingham Forest. The highly-rated defender had been linked with a move to the Premiership, with Newcastle and Liverpool thought to be interested. However, the 19-year-old has decided to stay at the City Ground. "I would love to play in the Premiership one day but there's no reason why that shouldn't happen at Forest, especially as we're doing so well in the First Division at the moment," Dawson said. "It's nice to see my name being linked with big clubs but as far as I'm concerned it's only speculation." Dawson has caught the eye of England manager Sven-Goran Eriksson and he was called up to the squad get-together in November. The teenager only signed a new five-year contract last summer but his progress this season has been rewarded with an improved deal. Forest boss Paul Hart said: "It's great news for everyone connected with this football club. "It's our way of showing that we recognise what Michael has done for us and to prove to him that we're a good football club who value his services."